Columnist and socialite Mary K. Davis gets herself killed. Was it her shrill voice that prompted someone to do her in? Or was it something the columnist said? Maybe her politician-husband didn�t appreciate her refusal to give him a divorce. Or perhaps that doctor didn�t like it when Mary threatened to expose his illegal baby-selling scheme. Perry and Della feel it�s an important enough issue to tamper with the evidence in defense of Leona Walsh, the nurse on trial for the crime. Burger�s out to put Della on the stand and get Perry for tampering. CARS: 1955 Chevrolet BelAir 4dr sedan, 2-tone: dark color & white; 1958 Buick Caballero Estate Wagon 4-Door, white; 1958 Cadillac convertible, black, white top up (Mason). From The Cars by Greg Cockerill. Anomaly: Berry Kroeger, listed as Eugene Jarech in the credits, is identified as Arthur Jarech in a building directory and by other characters. Submitted by daveb, 12/20/2007. Location: The same setup shot is used for the �Dr. Barnes Seaside Hospital� as in #54, TCOT Foot-Loose Doll. See here. Submitted by Charles Richmond, 6/2/2004. + Dr. Barnes Seaside Hospital is currently the Malibu residence of singer Cher. It has been on and off the market in 2008 for $41 million. Posted by Eric Cooper, 17 November 2009. Some pictures here. Mary K. Davis (played by Marian Seldes) was a newspaper columnist and socialite. In real life, Marian Seldes was the daughter of journalist/author/editor Gilbert Seldes and niece of journalist George Seldes. Submitted by Charles Richmond, 10/20/2008. Anomaly: The doctor in this episode is credited as Dr. George Barnes (played by Arthur Shields). Indeed, in the first part of the episode, Perry refers to him as Dr. George Barnes when talking with Paul. But during the beginning of the first courtroom scene, Mr. Burger refers to him as Dr. Philip Barnes. Submitted by Charles Richmond, 11/20/2008. Uncredited Actor: Don Anderson makes his 17th appearance in the first season as a courtroom spectator. Submitted by FredK, 25 Oct 2010. + When someone in the gallery stands to be identified, we clearly see former boxer Tom Kennedy in the front row, along with some other familiar faces (see Sightings, below). Submitted by gracenote, 9/2/2011. Goof: At 31:41, Dr. Barnes places the envelope in the fire; at 31:42, it begins to kindle; at 31:43, we see Mason getting a cup of water in the hall. At 31:56, thirteen seconds later, Mason returns to the office, and the envelope is still just beginning to kindle. Dr. Barnes says �I�m afraid you're a little late� (which isn�t quite true), but at 32:02, just six seconds later, the envelope is burned beyond all recognition. Submitted by 10yearoldfan, 7 August 2011. Sightings: Among the courtroom spectators are Distinguished Gentleman #1, Distinguished Gentleman #2, and Distinguished Lady #4�all on the prosecutor�s side. When someone in the gallery stands up for identification, Little Old Lady #2 is in front of him (as is DG #2). Over on Perry�s side sits Little Old Lady #1. What we�d like to know is, who are they? Submitted by gracenote, 9/2/2011. 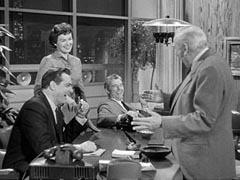 Syndicated cuts: Scene with Connie, Susan, and Ralph; Jarech making a date with Mary K for cocktails; Jarech and Mary K having cocktails; Mary K messing up the envelope, asking the attendant for another and tearing and throwing away the first; Leona at Mary K's apartment and phoning Mason. Additional Hallmark cuts: Part of Leona and Mary K's conversation that the doctor can't give Mary a baby, Mary says she can give the child everything, who her husband is, that her husband wants a divorce but is not because he thinks Mary K is carrying his child, Leona says she's sorry, Mary K doesn't want sympathy but for the doctor to make the trade; Mary K asking an attendant for pen, ink, stamp and an envelope and looking at Jarech from the ladies' room; part of Leona Walsh's meeting with Perry concerning requirements of adoption agencies, whether old people are less fit to raise children, that she knows many families who would give a child love and affection and Mason asking if Barnes was remedying the situation singlehandedly; Tragg telling Burger that Barnes has not seen Walsh and her fingerprints are in Mary K's apartment; part of Della waiting for the mailman checking her watch twice; long (1:35) scene of Burger calling Della to the stand and the conversation with the judge if it's permissible; the segue between Tragg leaving Mason's office with the dictating machine and entering the court with same is shortened on both scenes. Submitted by Wiseguy70005, 7/25/12. Changing Credits: The dot on the 'i' in Ray Collins' name becomes a square in this episode finally matching the square dots in the 'William' names (Hopper and Talman). In all previous episodes the dot was round. The dot on the 'i' in episode titles (when there is an i) continues to alternate between round and square dots, the square usually seen on the bolder font used for shorter words/titles but this is not always consistent. Submitted by Wiseguy70005, 2/8/13. ++ See also Episode #74 TCOT Startled Stallion for an almost-identical occurrence. Added by Dan K, 12/27/15. +++ And yet another example in Episode #4 TCOT Drowning Duck. Added by Dan K, 7/14/16. Goof: In the opening shot showing the houses and road along the beach, we hear the sound of surf, but the water doesn't move. Submitted by Alan Smithee, 4-16-14. +Della's fashion sense is impeccable: her gloves match the blouse she's wearing --- right down to the stripes! jfh 19May2017. Props: At approximately 6:30, note the smashed photograph of Ralph Davis (Philip Ober), which Mary K. Davis has hurled across the room. The identical photograph (then representing Sumner Hodge) gets smashed again in Episode #210 TCOT Tandem Target, although the frame and pattern of the smashed glass are different. Apparently this photograph has taken quite a bit of abuse. Submitted by Dan K, 1/1/16. This show is unusual in that Della is sworn in and must testify in the trial. Submitted by PaulDrake 33, 6/3/2009. + She's on the stand about four minutes but utters only 15 words due to Perry's relentless barrage of objections, all of which are sustained by the judge. I thought Burger was going to blow a gasket. Submitted by 65tosspowertrap, 17 April 2014. While certainly Mary K was written to be rather unlikable, I did not find her wholly unsympathetic as she was acting out of desperation to hold on to her unfaithful husband. And to say that her voice was shrill (as it does in the Summary) seems a little unfair, too. Slapping the secretary was designed to make here unsympathetic, but I would pretty mad, too, if I had found out my employee told a doctor I was unfit to be a mother. Submitted by gracenote, 9/2/2011. + Not wholly unsympathetic? A dissenting brief is hereby submitted: If we disregard only her tawdry blackmailing tactics, her despicable treatment of everyone else with whom she interacts in the episode, her lying about her pregnancy, her manic disposition, and her willingness to do anything and everything to get her way (including destroying other peoples' lives), what's not to like about Mary K. Davis? Submitted by BobH, 28 February 2016. Did anyone else notice the eye chart in the doctor�s office? It�s all E�s, every which way (sideways, upside down, backwards). Submitted by gracenote, 9/2/2011. + That chart is sometimes called a �Tumbling E.� It�s used with small children or adults who don�t know their letters. When I was a small child and went to the eye doctor, that�s the chart they used. I was instructed to point in the direction of the E. The Landolt C chart is based on the same idea. Submitted by billp, 09/29/2011. Once again we have an affluent, childless, unhappily-married couple. Submitted by 65tosspowertrap, 4-17-14. When Paul says at 19:22 "Gunther was her maiden name" the microphone recording the dialogue is not placed correctly. His voice sounds far away unlike his other dialogue. Submitted by Wiseguy70005, 8/01/14. Mary K was rather old-fashioned (or cheap). Recording cylinders became obsolete ten years before this episode aired. In TCOT Substitute Face we see Della using a somewhat more modern Dictabelt machine. Submitted by vgy7ujm, 29 January 2015. Don Gardner's name in the cast list leads to an IMDB entry for an actor named Don GARNER, who died in 1991. Don GARDNER passed away shortly after filming this episode, aged just 26 years of age. Submitted by Hermit Crab, 2/2/2017. + I just checked; the link has been fixed; it now points to the correct actor. OLEF641; 9/7/2017. ++ As was the case with fellow PM alum Judy Tyler, and perhaps unsurprisingly, Gardner was killed in a traffic accident (tho she died even before her episode aired, whereas he died shortly after his). Ironically, given the importance of the audio evidence during the trial, and Connie's over-the-top confession, his obituary listed his work on the show as being a "dialogue coach". Notcom, 090817. Goof: When Ruta Lee explains why she killed the victim, Lee�s lines are dubbed over, the words don�t match her lips. At the end of both sentences the audio says �you� but her lips say �me.� Submitted by Craig, 2/20/2010. + Also, at 36:39 Mason's line is dubbed when he says "Objected to on the grounds that the question calls for hearsay evidence..." His lips also do not match the words. Submitted by Wiseguy70005, 8/01/14. In the novel the screaming woman was an important part of the plot and occurred at the time of the murder (and screamed by a character who doesn't appear in the episode). In the simplified episode, the only screaming is done by Ruta Lee at the end of the episode. Perhaps this is the only reason Connie Cooper went into hysterics, to make the title of the episode make sense. Submitted by Wiseguy70005, 8/01/14. +Other than having the same title, the episode bears virtually no relationship to the novel. Submitted by BobH, 10 January 2016.